Bothell, WA – December 7, 2017 –The majority of manufacturing professionals across industry segments are under pressure to launch products faster and scale their operations. That’s a key finding in research conducted by Winshuttle in a recent New Product Introduction (NPI) survey and infographic. 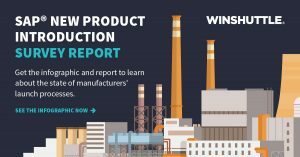 Winshuttle is excited to announce they’ve captured key insights after surveying over 120 manufacturing professionals around the world involved in the product launch process. In an effort to understand how the consumer product and manufacturing industries are impacted by changing market dynamics, Winshuttle’s research found that over 75% of respondents were under pressure to speed up their launches – and 75% expect their launch volume to increase in the near future, making the need to streamline operations apparent across industries. Whether you are responsible for a line of products or are in a supply chain, IT or master data role, this report provides benchmark data that can be used to make key business decisions around New Product Introduction (NPI) or product launch process improvements. Winshuttle’s New Product Introduction solution allows organizations to transform slow, manual and error-prone launches into agile processes to stay ahead of the market.